describes what you see in the picture by clicking on the correct answer option: A, B, C, or D.
The statements will not be printed on your screen and will be spoken only one time. (A) There is only one rescue vehicle in the picture. (B) One of the buildings in the picture is on fire. (C) A large crowd is watching the rescue efforts. 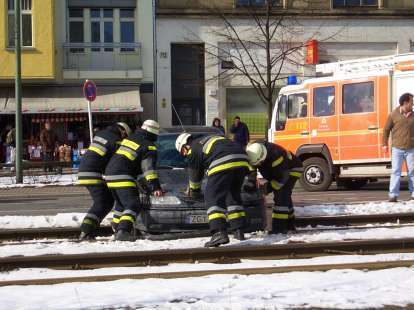 (D) There are two people trapped in the car. Statement (A), "There is only one rescue vehicle in the picture," is the best description of the picture, so you should click on answer (C).